Most of us think that longevity hinges on maintaining a normal Body Mass Index. But research conducted over the last decade hit the media in January with explosive news: Overweight and even moderately obese people with certain chronic diseases-from heart disease to cancer- often live longer and fare better than normalweight individuals with the same ailments. 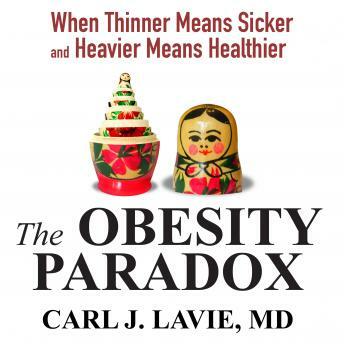 In this groundbreaking audiobook, Carl Lavie, MD, reveals the science behind the obesity paradox and shows us how to achieve maximum health rather than minimum weight. Lavie not only explains how extra fat provides additional fuel to help fight illness, he also argues that we've gotten so used to framing health issues in terms of obesity that we overlook other potential causes of disease. Picking up where the bestseller Fat Chance left off, The Obesity Paradox will change the conversation about fat-and what it means to be healthy.